It’s funny because a year ago, a lot of us in the industry were saying we couldn’t wait for this to happen,, said Campbell Hyers of Control Group, an IT consulting firm that works heavily with architecture firms. A lot has happened in a year. This is long overdue.. Parametric modeling responds to a long-standing problem with CAD. While visualization tools, such as Maya, are great for form-finding, they are unable to generate the precise measurements needed to convert complex models into buildable plans. For that, architects must export their work into an engineering program, such as Rhino, then into AutoCAD to produce project documents. Not only is this process inefficient, but it almost guarantees that information will be lost along the way. Programs with strong parametric modeling capabilitiesswhich, along with CATIA, include Solid-Works and Bentley Systems’ MicroStationntake care of all of that in a single environment and, as a result, the impossibly curvy designs rarely seen outside design school crits and Frank Gehry’s portfolio will be well within reach of most firms. We are working in an environment that offers a total simulation of a building to the point where, for example, plans and sections mean very little to our design process,, MacDonald said. And while PM is only slowly catching on, the firms that have adopted it have proven easy converts. Soon after founding Front in New York two and a half years ago, the firm’s partnerssarchitecture-trained Bruce Nichol, Mike Ra, and Marc Simmonssfound themselves in the fortunate but challenging position of working with Gehry Partners on a pair of projects, both of which required them essentially to become a parametric modeling shop. (OMA, Herzog & De Meuron, Kazuyo Sejima + Ryue Nishizawa Architects, and other firms have also come to them for technological support on various projects.) 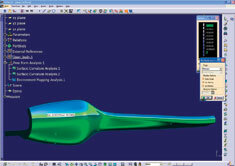 And while they have gone on to do a raft of non-PM workk?CATIA and Digital Project is a tool for us, just as AutoCad, Rhino, and Strand 7 are,, said Raa the trio hasn’t shied away from using the technology to tackle one of their own projects, the SCL Glass Head-quarters and Showroom in Brisbane, Australia. 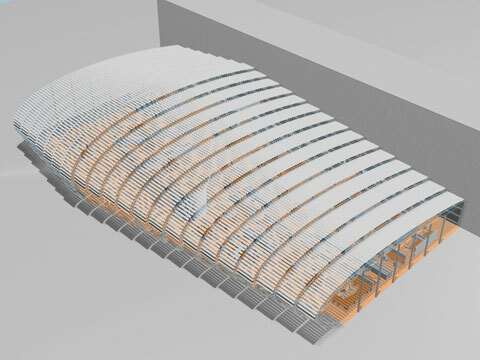 For the curvy shed, built entirely of glass made by the client, PM is allowing them to do with glass what Gehry does with titanium, imbedding information on the back end of the job that will be used for fabrication and construction,, said Ra. 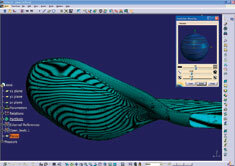 The CATIA model was subjected to surface curvature analyses (screen shots, far right). 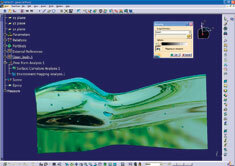 CATIA’s automotive reflection tools were used to simulate reflections. BIM, on the other hand, focuses on improving the production process. 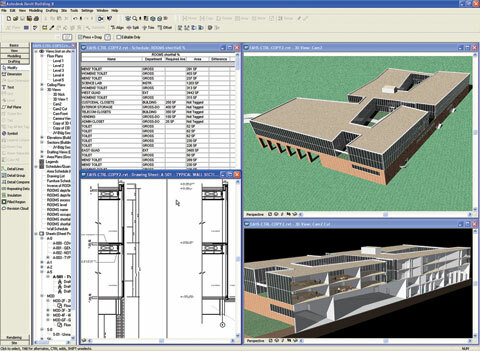 By embedding databases and schedules within 3-D models, BIM softwareesuch as AutoDesk’s Revit, Graphisoft’s ArchiCAD, and Nemetschek’s VectorWorks Architecttis able to quickly translate an architect’s ideas into schedules, budgets, and orders. We can very quickly generate a schedule that shows, say, the volume of concrete required by contractors,, said James Vandezande, who oversees digital design for SOM’s New York technical group. Thus not only architects but clients and contractors can immediately see the cost and duration of a particular project, and what happens to those variables when changes are made to the design. 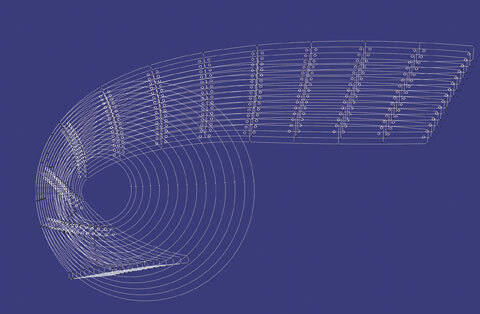 New Yorkkbased Front Inc. is an architecture and engineering firm and a parametric modeling specialist. For the SCL Glass Headquarters in Brisbane, the architects designed a shed entirely made of glass (rendering, left) to showcase the client’s various production capabilities such as curving, laminating, insulating, tempering, and shape-cutting. The building was modeled in CATIA (below) to be fabricated directly in the adjacent factory. It will take time to get used to. Right now even rich developers can hardly afford it,, said Winka Dubbeldam, principal at Archi-tectonics, who added that she is taking a wait-and-see attitude on the new software. That doesn’t mean in the future that they’re not going to be more affordable. And then I would love to have one of those multiplatform things.. For the time being, though, she’s content with what she hassa cocktail of Maya, Rhino, and VectorWorks. But most see PM and BIM as the future of the profession. 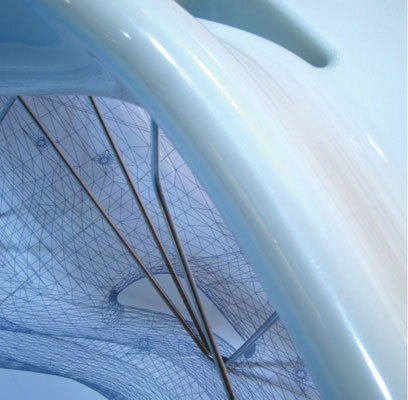 For one thing, parametric modeling has begun to find a place in the nation’s top architecture schools, especially as Dassault Systtmes, the French firm that owns both CATIA and SolidWorks, has sought out relationships with faculty and architecture programs. MacDonald noted, At Harvard, CATIA made a big push.. Two years ago, John Nastasi, who taught at the New Jersey Institute of Technology before going to Harvard and studying under Schodek, opened the Product Architecture Lab, a master’s degree program in the Department of Mechanical Engineering at the Stevens Institute of Technology in Hoboken. It’s one of the first programs in the country to rely heavily on CATIA. It’s the only tool I’ve found that aligns itself closely with how a building goes together,, Nastasi said. Malcolm Davies, CEO of Gehry Technologies, said he hopes his company’s Digital Project is a step toward just that sort of convergence. We have mechanical engineering products integrated and all the function of CATIA,, he said. At the same time, he added, the software has a more user-friendly interface and leaves out many of the expensive non-architectural functions in CATIA. Indeed, the fast-paced developmenttand ultimate convergenceeof PM and BIM technologies point to a common horizon: a seamless relationship between design, construction, and maintenance in which pure data is the only deliverable. Ten years from now,, mused Carl Galioto, a partner in SOM’s New York office, we will be having a drink and laughing about how we used to draw in two dimensions and delivering sheets of paper.. IT guys (and they are mostly guys) are the heroes of the modern office. They fix our email when it’s not working, retrieve crashed files, advise us on hardware and software needs, debug and reset whatever needs debugging or resetting. But one firm, Control Group, is pushing the idea of technology support to another level. Just as architects hope for enlightened clients to father their procreations, the partners of Control GrouppCampbell Hyers, Colin O’Donnell, and Scott Andersonnare pleased to have clients who challenge them to propose solutions that not merely support but enable more creative design processes. When Hyers talks about the build-out of their new office, a raw Tribeca floor-through, it’s clear that he’s as much a design freak as a tech geek: He worked as an architect for half a dozen years at Rafael Viioly Architects before starting Control Group with O’Donnell and Anderson, who have backgrounds in networks and design technology. Their office won’t need much design work, though: On any given day, it’s near-empty, as most of the company’s 19 employees are scattered throughout the city providing support for the firm’s nearly hundred clients, the majority of which are architecture and engineering firms, including Studio Daniel Libeskind, 1100 Architects, Nicholas Grimshaw Partners, Diller Scofidio + Renfro, Buro Happold, and yes, Rafael Viioly. Control Group is not the only technology consulting firm geared towards architects, but it is unique in its aspiration to treat technology as a flexible entity. It started out with clients asking us to host their networks and systems,, said Anderson, pointing out the advantage of being able to check on a firm’s programs and files remotely and the potential to allow firms to share their work with collaborators. Consequently, Control Group established a server in a former army facility in Brooklyn. More importantly, they found that most firms’ technological growth occurs in an ad-hoc, incremental fashion, which often left them stuck using systems that don’t best suit their current needs or future goals. We hate to be the ones telling an architect that he has to invest $25,000 in a new server and software,, said Anderson. They are now developing an idea which they’ve dubbed utility computing,, drawing comparisons to how electricity is distributed. Early on, power stations were small, not particularly powerful, dispersed, and many people even had their own generators. The same goes for water, with people tapping into their personal or local resources. Gradually, larger centralized stations served greater areas, bringing efficiencies and savings. With utility computing, however, firms can purchase technology as they need it. Control Group envisions a system in the future in which each user can log onto their computer in the morning and select the programs they will need that day, and pay a low rate per program, only for the days that they need it. You could tap into it like water, by the glass,, said O’Donnell. We are hosting services and applications, like Microsoft Exchange, offsite for our clients right now,, said Hyers. We are developing relationships with other hardware and software vendors to bring their particular technology to our clients in an affordable by the drink’ format, and expect to release those as they are available next year.. In general, many firms are now rethinking their CAD strategy (especially with the emergence of building information and parametric modeling programs), and enlisting an outside party to help them take stock and plan for the future. And, according to Hyers, the more Control Group can plan, the more it can control each client’s tech environment and working conditions. We’re trying very hard not to become enablers of past problems,, said Hyers; that way, they can focus more on developing other ideas to help the profession function better. And it seems that there is more to come; said Hyers, the concept of utility computing is more of a direction than a destination..